The class was built between 1899 and 1903, numbering just ten in all. Not quite a surprise as the Nederlandsche Centraal Spoorwegmaatschappij, Dutch Central Railroad Co, NCS was ever short of funds and was effectively only operating one mainline, allbeit a very crucial one: between Utrecht and Zwolle, the main artery through the centre of the country. All plans to expand the network came to naught and by the end of WW1 it was absorbed. As it served the wealthy centre of the country the company had a taste for luxury. Even the modest 4-4-0 class must have looked poche in its abundant lining on its mainly ocre color scheme. 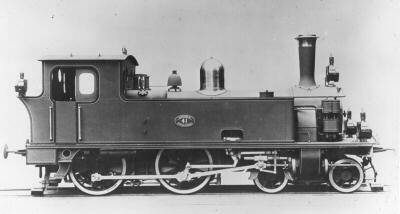 The locos were revised pretty often. The story goes that the ten locomotives of the class were identical at only two moments: when delivered and when scrapped. For their relative small size they were strong engines accelerating well. Surprisingly they were suited for a respectable 75 km/h. Their most known work area was on the Haarlemmermeer lines. In 1954 the last engine was gone. No 7009 was sold to a chemical plant in 1951 and survived until 1965. It is most unfortunate that even as late as that, this engine did not make it into perservation and was scrapped. I got a DJH model of the loco from my wife, yep very traditional, I know. It was my first model and my re-entry to the hobby. Over the course of three years I acquaintenced myself with the basic techniques, acquired the basic tools and made the basic errors ;-) But this is the end result, a tad too glossy for my taste, still I'm proud of it. You can find some more information in the project section.